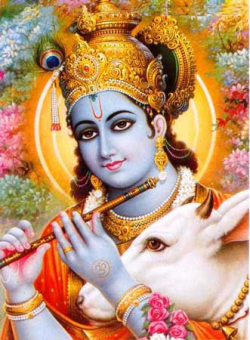 Krishna is a major Hindu deity worshiped in a variety of different perspectives. Krishna is recognised as the Svayam Bhagavan in his own right or as the complete/absolute incarnation of Lord Vishnu. Krishna is one of the most widely revered and popular of all Hindu deities. Krishna's birthday is celebrated every year by Hindus on the eighth day (Ashtami) of the Krishna Paksha (dark fortnight) of the month of Bhadrapad in the Hindu calendar. Krishna is also known as Govinda, Mukunda, Madhusudhana and Vasudeva. Krishna is often described and portrayed as an infant eating butter, a young boy playing a flute as in the Bhagavata Purana, a young man along with Radha, a young man surrounded by beautiful women or as an elder giving direction and guidance as in the Bhagavad Gita. Krishna is a major deity in Hinduism. He is worshiped as the eighth avatar of the god Vishnu and also as the supreme God in his own right. He is the god of compassion, tenderness, and love in Hinduism, and is one of the most popular and widely revered among Indian divinities. Sri Krishna Dhyanamala - I shall meditate upon supreme Lord Govinda along with Rukmini Devi and eight favorite wives who carries vessels full of precious gems, seated in an magnificent throne positioned in the middle of a marvelous hall constructed with the precious gems under the Kalpavruksha, his four hands carries Conch, wheel, mace and lotus flower, he is Lord Govinda who has the luster of precious yellow metal. I shall meditate upon Lord Gopala along with Bhoodevi and Lakshmidevi, seated on the throne decorated with gems in the garden of Kalpavruksha located in the middle of milky ocean, he has eight hands that carries lotus flower, wheel, sugarcane bow, spear, arrows, rope, flute and divine flute, he has crimson color complexion , he is worshiped by Lord Bhrama and deities. 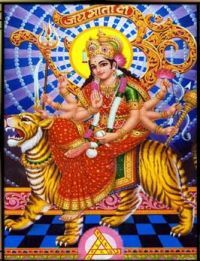 I shall meditate upon Lord Hari along with Bhoodevi and Lakshmidevi, seated on the throne decorated with gems in the garden of Kalpavruksha located in the middle of milky ocean, he carries conch, flute, spear and rope. Tune in to this melodious Krishna Mantra popularly known as Krishna Chalisa and sing along with the help of lyrics only on Rajshri Soul. It is believed that whoever sings this song cheerfully will have his troubles removed and will be freed from sins and diseases. While Chalisa means "forty verse" prayers, Verses that praise and plead with devotion. They are recited over and over again or chanted by groups. The acts and deeds of deities are recalled in these verses to aid the devotee to meditate on righteous and noble qualities.